My Take: Can Zipcars save my dying church? Editor's Note: Mark Barger Elliott is senior pastor of Mayflower Congregational Church in Grand Rapids, Michigan and author of "Creative Styles of Preaching." His blog Faith in the World identifies stories of hope from around the world and places where religion intersects everyday life. The prospect of death typically prompts action. Doctors offer experimental trials. Tuna casseroles appear on doorsteps. Families ask that loved ones to be placed on church prayer lists. As a pastor, I’ve seen that when time grows short, people feel compelled to do something. Best-selling books such as "1,000 Places to See Before You Die" owe their popularity to that human instinct. I’ve thought of this lately as I’ve begun to watch my church die. Not the local church I serve in Grand Rapids, Michigan, but the larger church of which I’m a part – what we know as the mainline church. Unlike megachurches that flourish in places like abandoned shopping centers and movie theaters and draw visitors with LED signs, mainline churches typically are built on downtown corners and along winding country roads. Our moveable type signs read: Methodist, Presbyterian and Congregational. While megachurches – which typically represent Christianity’s evangelical or nondenominational arms - offer cappuccino bars and hologram images of pastors, we are identified by spires and white clapboard, cemeteries and pews and pastors draped in fraying black robes. In the last 50 years, mainline church membership has plummeted by more than 25%, to about 20 million people, according to a recent report from The Barna Group, a major church research firm. Barna found that only 15% of American adults are associated with a mainline church today, a stark contrast to a time when our influence was wide and broad. The Supreme Court, for example, was once composed entirely of mainline church members. Today, it has no such members. In many ways, the mainline church functions today as GM did before its 2008 government bailout. Our product lines have grown outdated (think tattered hymnals, wheezing organs and pastors preaching stiffly behind pulpits). Our ability to respond to demographic and cultural changes is impaired by a business model that clings to tradition and is wary of collaboration and innovation. Important but secondary issues – for example, disputes over sexual orientation – have led to conflicts that hold scant appeal to potential new members. So we find ourselves stuck like GM in 2008, unable to imagine a new mainline church, unable to produce something as dynamic and vibrant as say, a hybrid Ford Fusion. Fortunately, serving as a mainline pastor for 15 years has taught me this lesson: Sometimes the patient revives. Those who walk through the doors of a hospice facility do, on occasion, walk out. Our revival, I believe, can be sparked by a process that author Lisa Gansky calls "better things, easily shared." In her book "The Mesh: Why the Future of Business is Sharing," Gansky points to Zipcar as an example of how this works. 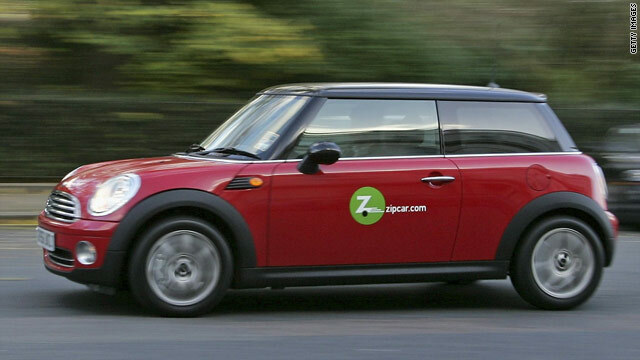 Zipcar uses the internet to offer customers the opportunity to share resources (a nice car) and, thereby, costs. It appeals to those who need a car for only a few hours, or part of the day. Zipcar users save $400-600 a month by sharing the costs of gas and insurance. How do we apply "better things, easily shared" to the church? In regards to reducing costs, I know my own church facilities often sit unused during the late afternoon and evening and could easily be offered to the community or other churches. A website might coordinate church space "customers," just as some companies now advertise office space you can rent by the hour or day. We could intentionally seek to identify and to share our "better things." A significant proportion of my week, for example, is spent writing a sermon. Not all pastors have that luxury of time. While websites do offer sermons, it is frowned upon to "borrow" someone else's work. Could that change? Mainline denominations could approve a website where "the best" sermons are posted. The same process might be applied to administrative resources, church choirs and educational resources. How about a mainline church "better things, easily shared" conference where our "better ideas" are shared in short talks that are then posted on the web - a very successful formula for organizations like TED. Could it be time to identity potential outside collaborators like Gansky, who could help steer us in the direction of our own hybrid Ford Fusion? Reviving the church may seem like a long shot. But sometimes the dying - and even the dead - do revive. The mainline church does have a name for that experience: Easter. The opinions expressed in this commentary are solely those of Mark Barger Elliott. Next entry »What's it like to be crucified? Woah this blog is magnificent i like reading your articles. Stay up the great paintings! You recognize, lots of individuals are searching around for this information, you can help them greatly. Hi, Neat post. There is an issue along with your web site in internet explorer, may test this? IE still is the marketplace leader and a huge component to other people will miss your fantastic writing due to this problem.